These tiki’s are brilliant!! I would love to challenge my students with this project next trimester. If you have a lesson plan that you are willing to share or some useful tips…I would greatly appreciate any help you could offer. I would love to make these with my Art8 students… would you please share some of your introduction materials or research resources with me? Aloha All! Thanks for the positive responses… this turned out to be a really successful lesson that my students LOVED! I’m sorry to those of you requesting a lesson plan because I don’t create formal lesson plan documents (It’s not really my style and honestly doesn’t help me teach). I delivered some “mini-lessons” on tiki history, style, and symbolism. If I had more time, I would have also compared/contrasted with other ancient multicultural art forms. We practiced drawing different versions of Lono, Ku, Kanaloa, and Kane in sketchbooks as a class before students came up with their own designs. 2. Slab base- a simple circle. We traced the bottom of a squirt bottle as a template. These are wonderful! How long did it take to do the clay pieces? How big are they? It’s hard to get a sense from the photos. Can’t wait to see the update after they’re done with the glaze! I would like to learn more about this tiki project. I had so much fun last year. One thing that I like about these sculptures are the designs on it. 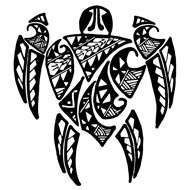 I want to learn more about tikis. I am an art teacher in Seattle, and I told my partner “Maybe we can get permission from our school for a trip to Kauai to meet you!” I’m only partly kidding. Your student work is phenomenal and we want to know how you achieve it. Do the students coils up first, then add slab and then add the face on the slab? How are these 7th graders so able to make such tidy, crisp designs? Do they attach the pieces after they are a bit leathery? My experience is that young students squish things a lot, and are not careful. Also they resist all the tidying. You say you used 4 months. We meet twice a week for 45 minutes and could have through December. Doable? We plan on having them make a little coil pot first, a pot that keeps the coils visible on the outside, employs some negative space, and uses little balls as well…just to give them experience in this type of thing. We will have some new students who are not too familiar with clay. Any other suggestions? Thank you, Julia. I wish you a thrilling year of art with your students!! You are an inspiration. These are phenomenal. I would love the lesson plan. The decorative techniques used are advanced for this age group. A successful project is always the result of a well planned lesson plan. I love, love, love this project. Thank you so much for sharing. This year I am planning on changing the focus from Tiki to totems of the Northwest Pacific First Nation People. Teaching coil building and culture while allowing for each student’s creative expression. Thanks again for the idea. 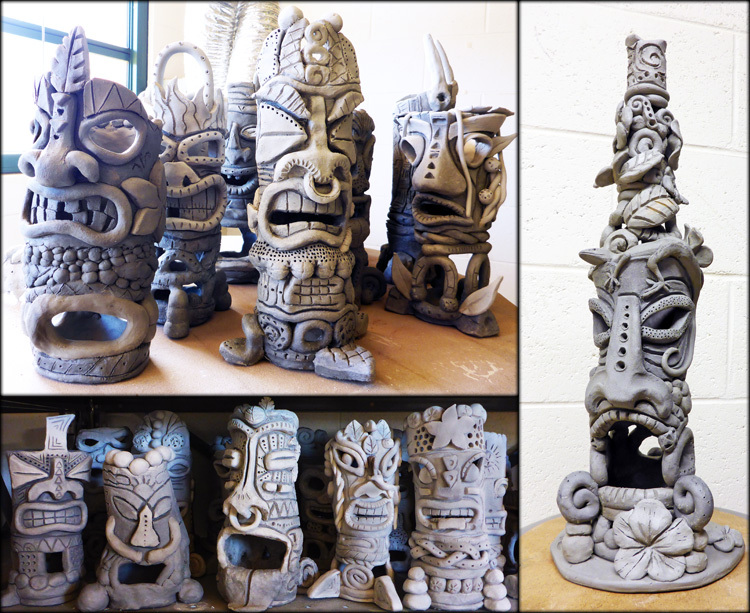 I do a similar project with High Schoolers in a level 2 scuplture class and these are… Wow! We start with a thick slab cylinder and carve into it much like you would if it were a tree. But, I must say that I love all of the additions. I think that you have convinced me to coil build if only for the benefit of all of the great textures.